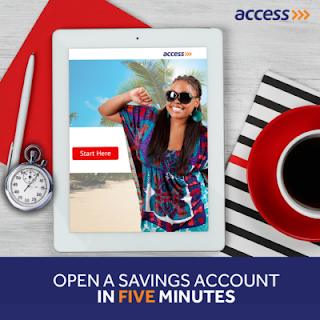 Access Bank Plc is a Nigerian multinational commercial bank, owned by Access Bank Group. The bank now allows prospective customers to easily open a bank account without stress via their mobile phone. Find out all the requirements and other important details as you read on. Recently, Access bank launched a short code that allows her customers pay bills, buy airtime, transfer funds and other transactions, this *901# short code also comes with a feature that allows prospective customers to open a new Access Bank savings account. To open the account using your mobile phone, simply dial *901*0#. Choose BVN or Personal details, respond to the remaining prompts correctly then wait for confirmation message containing your Access Bank account number. If you have your BVN with you i suggest you choose the BVN otherwise choose Personal details. Use of BVN makes it more easier. NB: If you choose to use BVN for the account opening, it is better you dial the code on the mobile line that is registered on your BVN profile else you may get an error code stating that the records does not match. Your Access Bank account is ready for use as soon as you complete the process but you need to fully activate the account by going to the nearest Access bank branch with your Passport photograph and valid ID.